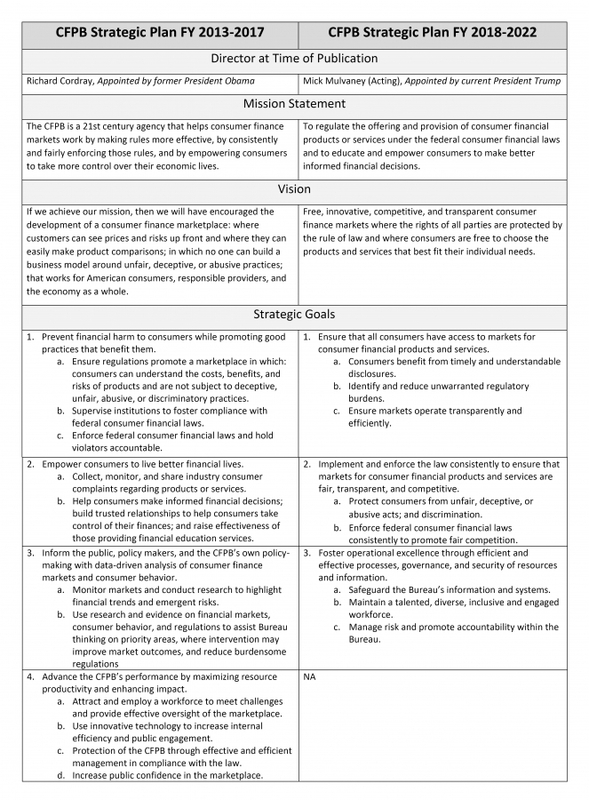 On February 12, 2018 the Consumer Financial Protection Bureau (CFPB) released its Strategic Plan for FY 2018-2022. A lot has changed since the first five-year Strategic Plan for FY 2013-2017 was published. Regardless of how small your institution may be, all institutions are affected by the actions and the direction of the CFPB. Although small banks and credit unions may not be directly supervised by the CFPB, they still are subject to the federal financial consumer protection laws the agency oversees. The CFPB has immense power in that it has the authority to enforce and make revisions to existing regulations, as well as promulgate new ones. In keeping with simplicity, I developed a comparison chart that you may use to draw your own conclusions (and inform your CEO) which direction the CFPB appears to be taking. Statements by new acting director Mick Mulvaney such as “we have committed to fulfill the Bureau’s statutory responsibilities but go no further” and vowing against misuse of the bureau’s “unparalleled powers” are promising. It seems that the ‘new’ CFPB plans to take a more reasonable approach to rulemaking and enforcement. Despite the promising outlook for the industry, don’t let your guard down and do continue your current vigilance in providing products and services designed to suit the individual consumer’s needs. It is not only good for the consumers, but it’s good for your financial institution. In my own experience, nothing feels better than always doing the next right thing. Sarah is a consultant in the Financial Institutions Advisory Group of Saltmarsh, Cleaveland & Gund. Her primary areas of expertise include providing compliance reviews, assisting with special research matters and consulting on deposit and lending related regulations as well as social media approaches for financial institutions.